You should never ignore the final process to ensure your documents have that professional look and feel to create a lasting impression. We offer a complete finishing service for all sizes of print. Mount your prints for shows, have your posters and banners laminated to protect them and give them a high quality finish. Sometimes the simplest detail can have a huge impact! Add value and achieve that professional look by finishing your print appropriately. Choose from wire; plastic; thermal or perfect binding and many more, to give your document a professional looking finish. 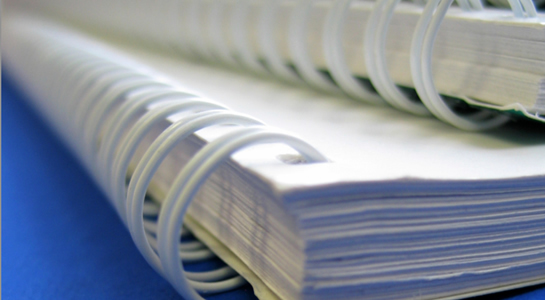 We can laminate any size; punch; trim and fold documents to your exact requirements. We can enhance your print presentation no matter what size, adding impact and protection. We can add bespoke full covers onto many media to give your documents an impressive professional feel. Larger prints or copies can be mounted onto a variety of lightweight, durable boards. Edging or framing can also be aded, serving both a protective & decorative purpose and water-resistant, U.V. inhibiting. Lamination is another protective option.